The Politics of Aesthetics rethinks the relationship between art and politics, reclaiming "aesthetics" from the narrow confines it is often reduced to. Jacques Ranciere reveals its intrinsic link to politics by analysing what they both have in common: the delimitation of the visible and the invisible, the audible and the inaudible, the thinkable and the unthinkable, the possible and the impossible. 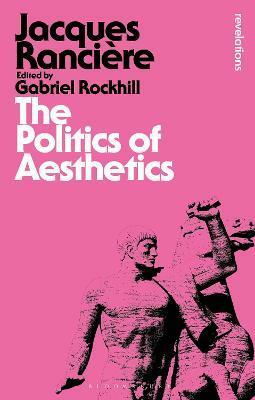 Presented as a set of inter-linked interviews, The Politics of Aesthetics provides the most comprehensive introduction to Ranciere's work to date, ranging across the history of art and politics from the Greek polis to the aesthetic revolution of the modern age. Available now in the Bloomsbury Revelations series 10 years after its original publication, The Politics of Aesthetics includes an afterword by Slavoj Zizek, an interview for the English edition, a glossary of technical terms and an extensive bibliography. Translator's preface: The Reconfiguration of Meaning Translator's Introduction: Jacques Ranciere's Politics of Perception \ The Politics of Aesthetics \ Foreword \ The Distribution of the Sensible: Politics and Aesthetics Artistic Regimes and the Shortcomings of the Notion of Modernity \ Mechanical Arts and the Promotion of the Anonymous \ Is History a Form of Fiction? On Art and Work \ Interview with Jacques Ranciere for the English Edition: The Janus-Face of Politicized Art \ Historical and Hermeneutic Methodology \ Universality, Historicity, Equality \ Positive Contradiction \ Politicized Art \ Afterword by Slavoj Zizek: The Lesson of Ranciere \ Appendix I: Glossary of Technical Terms \ Appendix II: Bibliography of Primary and Secondary Sources \ Index. Jacques Ranciere taught at the University of Paris VIII, France, from 1969 to 2000, occupying the Chair of Aesthetics and Politics from 1990 until his retirement. Gabriel Rockhill is Assistant Professor of Philosophy at Villanova University, USA. He also teaches at the Centre Parisien d'Etudes Critiques and the College International de Philosophie, France. He is the author of Logique de l'histoire: Pour une analytique des pratiques philosophiques (Editions Hermann, 2010) and Pour un historicisme radical: Entre esthetique et politique avec Ranciere (Editions du Sandre, forthcoming).